Convergely – How do I create and assign tasks in Hipchat? » How do I create and assign tasks in Hipchat? 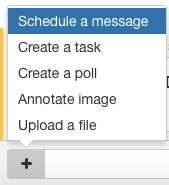 How do I create and assign tasks in Hipchat? Creating a poll using HipChat Connect is easier than ever! Using our user-friendly, simple interface, select your desired action from the app’s menu, as shown below.